Deere is now accepting orders for the new narrow track models and production will begin in January, 2018. Three new 9RX Narrow Track Tractors have been introduced by John Deere. They are available with 420, 470 and 520 horsepower to handle a wide variety of jobs, regardless of the size. Each machine is equipped with a narrow undercarriage and have four-track configurations. "No other tractor manufacturer offers customers so many choices in high-horsepower tractors, and they're each backed by the best dealer network in the industry," said Tiffany Turner, product marketing manager for John Deere. The tractors can be fitted with 18-inch or 24-inch-wide tracks and set to a track spacing of 80 inches, 88 inches or 120 inches. All of the new tractors are an ideal fit for 22-inch, 30-inch and 40-inch row-crop applications. "When a 9RX Narrow Track Tractor is utilized in a row-crop setting there are only two track paths going down the row instead of the tracks made by tractors equipped with duals or triples," Turner added. 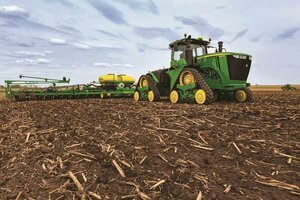 "Narrow track tractors can reduce the negative agronomic effects on pinch rows, reduce soil compaction and minimize soil disturbance for greater yield potential." The new machines feature a CommandView III cab with four-corner cab suspension. ActiveCommand Steering makes the tractors a breeze to maneuver, and rubber isolators reduce vibration for a smooth ride. The Gen 4 CommandCenter Display can be used to manage the performance of the machine. For more information on all Deere tractors, visit www.JohnDeere.com/ag or speak to your local John Deere dealer.